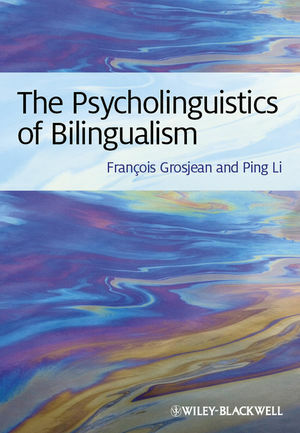 The Psycholinguistics of Bilingualism presents a comprehensive introduction to the foundations of bilingualism, covering language processing, language acquisition, cognition and the bilingual brain. François Grosjean is Professor Emeritus of Psycholinguistics at Neuchâtel University, Switzerland. His many publications on bilingualism include three books: Life with Two Languages: An Introduction to Bilingualism (1982), Studying Bilinguals (2008), and Bilingual: Life and Reality (2010). The latter was selected as a Choice Outstanding Academic Title. He is a Founding Editor of the journal Bilingualism: Language and Cognition and was its first Coordinating Editor. Ping Li is Professor of Psychology, Linguistics, and Information Sciences and Technology at Pennsylvania State University. His books include The Handbook of East Asian Psycholinguistics: Volume 1, Chinese (co-edited with L-H. Tan, E. Bates, and O. Tzeng, 2006), and The Expression of Time (co-edited with W. Klein, 2009). He is Editor of the journal Bilingualism: Language and Cognition, and is on the Editorial Board of four other prominent journals.